One of the major cultural and commercial hubs of Florida, Miami is the biggest city in the southern half of the state and the county seat of Miami-Dade County, the most populous county in all of Florida. Located on the Atlantic Coast of the Sunshine State, Miami covers an area of around 56 square miles and has an estimated population of over 460,000 people, with more than 6 million in the surrounding metropolitan area, making it the seventh most populous metropolis in the United States. Various Native American tribes lived around the Miami area for several millennia before European settlers arrived. The area was claimed by Spain back in 1566, with Spain and Great Britain holding control of Florida until it eventually became part of the independent United States. Miami is generally classed as the only major American city that was founded by a woman. Julia DeForest Tuttle owned the land on which Miami was built and was known as the "Mother of Miami" for her contributions to the city's development. Miami was incorporated in 1896 and was very small at the time, but rapidly grew into a major city due to its hot climate, beautiful beaches, ideal import/export location, Latin American immigration, and various other factors. Nowadays, Miami is a city known far and wide. It has appeared in many TV shows and films, with its stunning skyline and sunny weather attracting many residents and visitors each year. All sorts of activities can be enjoyed in and around Miami, with the city boasting a thriving nightlife, dozens of outdoor activities, and some of the best beaches in the Sunshine State. The elevation of a city tells us how high or low it is in relation to sea level. 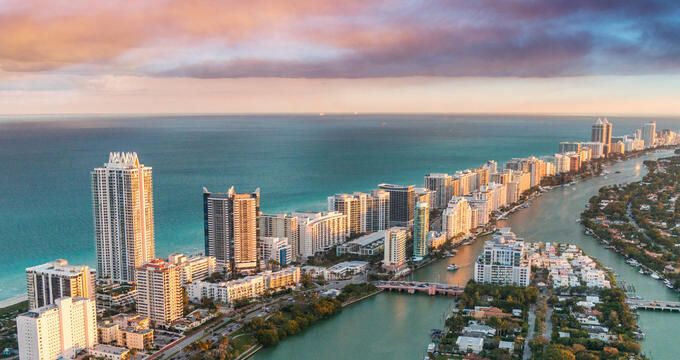 Many major cities around the United States, like Miami, are situated in coastal locations, so tend to have relatively low elevations of less than 500 feet (152 m). Miami's elevation is just 6 feet (2 m), with its highest point reaching 42 feet (13 m). This is in line with much of the rest of Florida, which is the third lowest state of all in terms of mean elevation. Only Delaware and Louisiana have lower mean elevations than Florida, which records a rating of just 100 feet (30 m) in this statistic. Florida also has the unique distinction of being the flattest state of all, with the smallest difference between its highest and lowest points. The highest point in the entire state of Florida is Britton Hill, a relatively small high in Walton County on the Panhandle, which has an elevation of 345 feet (105 m). The state of Florida’s lowest point is the waters of the Atlantic Ocean and Gulf of Mexico, which are at sea level. Due to the fact that Florida has such a long coastline and is generally very flat, without any big mountain ranges or high areas, most of its towns and cities have low elevations. The state's capital, Tallahassee, has an elevation of 203 feet (62 m), while Orlando, one of the Sunshine State's most famous cities, has an elevation of 82 feet (25 m). Tampa, meanwhile, has an elevation of 48 feet (14.6 m), while the city of Jacksonville has an elevation of 16 feet (5 m). So, when compared to almost any other city around the Sunshine State, Miami usually has a lower elevation and is one of the lowest major cities in the entire United States. The city of Miami is well-known for its huge amount of sunshine and immensely warm weather. Miami has a tropical monsoon climate, with its low elevation, latitude, and proximity to the ocean playing key roles in its typical weather. Temperatures are high all year long. Even in the coldest months of the year like December and January, temperatures can reach highs of 78°F (26°C) very easily, with those temperatures rising up to 95°F (35°C) and beyond in the hottest months like July and August. As one of the major cities in one of the most touristic states of them all, there's naturally a lot to do in Miami. The city is famous for its nightlife, boasting a lot of clubs, bars, and other locations for friends and families to hang out in the evenings. In the daytime, the beaches are often crowded with sunbathing tourists and the Atlantic Ocean waters are great for sailing, fishing, surfing, and more.